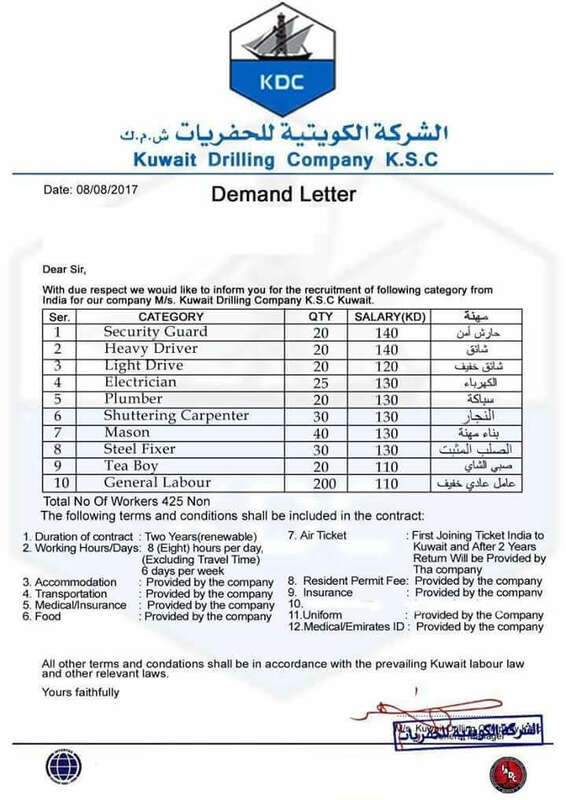 HUGE GULF CONSULTANTS KUWAIT JOBS- Machinist-1 Salary – 160 KD The Candidate Should be ITI with 1 Year apprenticeship and Have Min 3 yrs Exp in Industrial worship, Should have Exp in milling machine, lathe machine, drilling Machine, Shaper, grinding Machine. Welder / fabricator -1, Salary – 160 KD The Candidates should be ITI OR Trade Certificate with Min 3 yrs Exp in steel Fabrication workshop. Familiar with Fabrication Workshop. Familiar with fabrication of Silos, Hoppers, Chutes and must work as a welder also. Must be able to Understand the drawings and do the fabrication accordingly. Compressor Technician Maintainance-1 The Candidates Should be Diploma in Mechanical Engineering with Min 3 Yrs Experince in Operation & Maintanance of Industrial Compressors – (Rotary and Reciprocating) Exp in maintenance of centrifugal pumps and water cooling tower will be added advantage. MEchanic Maintainance – 1 150 KD, Mixer Operator – 15 Salry 150-200 KD (Any License), concrete Pump Operator – 4 200-300 KD (Any License), Concrete Pump Helper -4, Slary 115 KD. Fork Lift Operator -2 160 KD (Any LIcense), Loader Operator – 1 120-195 KD (Any License), Tire Man – 1 140 KD, Light Driver -1 Sal 120-150 KD ( NAy Liecense), MEchanical Equipment Technician – 4 190 KD, Electrician – 1 200 KD, Lab Technican – 6 160 KD, Construction Helper – 50 100 KD, Asst. Technician (Helper) – 4 Slary 115 KD. Ice making Plant Operator – 5 (160 KD0, Heavy Vehicles Mechanic – 5 (180 KD). Gulf Consultants KUWAIT JOBS VISA : FREE RECRUITMENT. Require KUWAIT. highly reputed clients -the following for one of our CIVIL ENGINEERS MECHANICAL ENGINEERS SURVEY ENGINEERS ECNR 2 Passport holders MATERIALS (QA/QC) ENGINEERS SAFETY ENGINEERonly SUPERVISORS DRILLING/PETROLEUM ENGINEER for drilling in Oil and Water wells Water well Rigs, preferably Challenger Rigs. VIT ENGINEERS maintenance of Diesel Engine and Waterwel Rigs. VISO INTERNAL AUDITORS STORE KEEPERS SECRETARIES.nSuitably qualified applicants with minimum of 10 years of relevant Experience may apply immediately with a detailed CV, copies of certificates passport and photograph by courier to ROYAL First PVT LTD. D’Silva Building, SK Bole Opp. Sahakari Bhandar West Mumbai. 8080 464 135 tel:2437 5050.
structural febrycator .uae experience 2years. India experience 7years. i am working qad engineer for 2 years and i intersted working for gulf country. I am c.irfan Basha from ap.